This contemporary style modern apartment has breathtaking sea view it is situated in the one of the best areas of the exclusive & charming village of Puerto Andratx (La Mola), surrounded by the breathtaking panoramic mountain landscape.The recently completed development of La Molazul won 3 awards at the 2007 international property Awards, for the Best Apartment, Best interior design and best development. 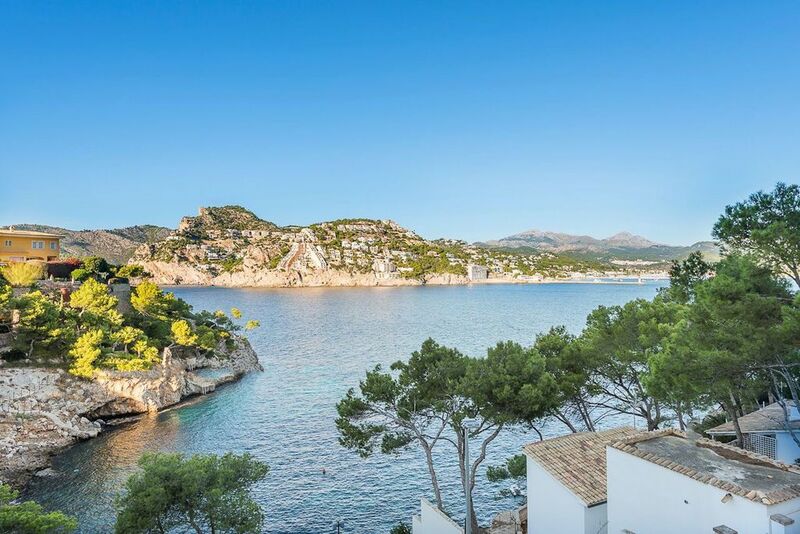 A 2 bedroom, 2 bathroom apartment enjoying magnificent sea views across a delightful bay at Puerto Andratx. The apartment boasts an amazing infinity pool with direct sea access. The apartment is brand new with a 145m2 area and a magic sea’s edge location, the open plan living room is light and sunny with large glazed doors looking out to the terrace, enabling the dramatic sea views to be enjoyed immediately upon entering the apartment. The open plan, new fully- equipped kitchen features a breakfast bar. There is also a wood burning fire and bespoke mood lighting throughout. Puerto Andratx Area: The beautiful city of Palma and all its facilities is within easy reach. The lovely beaches at Camp de Mar and Paguera are very close. You will find everything you need in Port D'Andratx itself, but a car will enable you to get to the harbour easily (less than 5 minutes drive) and make the most of this beautiful island with visits to Deya, Valldemossa and Soller or why not take in the glamour of Puerto Portals. Relax on the Golf course if that is what you want to do, or take in the Spa at the Mon Port hotel in Port D'Andratx or at the Dorint in Camp de Mar. Puerto Andratx Area: This brand new luxury apartment is set in the hills above Port D'Andratx. Holiday with the rich and famous in this exclusive location where you can dine in the exquisite restaurants that line the harbour or watch the boats sail by. This is a fabulous location, mainly missed by the tourist crowd due to the restriction on hotel construction. Most people who holiday here own extremely expensive villas in the hillside or one of the yachts that line the harbour. Only 20 minutes from the centre of Palma (35 minutes from the airport) the beaches of the South West of the Island (Camp de Mar and Paguera) are within 5-10 minutes by Car as is Golf, two Spa hotels and all the shopping you will need. The apartment sleeps up to 4. This brand new luxury apartment is set in the hills above Port D'Andratx. Holiday with the rich and famous in this exclusive location where you can dine in the exquisite restaurants that line the harbour or watch the boats sail by. This is a fabulous location, mainly missed by the tourist crowd due to the restriction on hotel construction. Most people who holiday here own extremely expensive villas in the hillside or one of the yachts that line the harbour. Only 20 minutes from the centre of Palma (35 minutes from the airport) the beaches of the South West of the Island (Camp de Mar and Paguera) are within 5-10 minutes by Car as is Golf, two Spa hotels and all the shopping you will need. The apartment sleeps up to 4. Parking is on the street but is never a problem as the property is located at the end of a dead end road. We couldn’t have asked for a better place to enjoy five days of very mixed weather. The apartment is spacious, very light, well-equipped and with stunning views over the sea. A lovely place to relax and look out over the port and mountains and enjoy the occasional thunderstorm. At the end of a dead-end road, the location is very quiet but just a lovely 10- 15 minute walk into the port . The children (teenagers) spent hours down by the sea at the bottom of the apartment complex. Wouldn’t hesitate to book again, even out of season. Our sat-nav kept taking us into Andraxt and not to the Port so in the end I rang Dawn and she really kindly came to guide us to the apartment, she was also really helpful with all sorts of information. We liked the apartment very much, it was spotless, the beds were comfortable and the bathrooms very well appointed. The kitchen was really well equipped which was a good job as one of our guests was a Michelin star chef in London ! The terrace was more than big enough for all of us to eat outside and the views just stunning. The time of year (early October) meant there was no sun on the terrace but we didn’t mind at all as the view was compensation enough. We didn’t use the pool but it looked beautiful. One small point that the leather sofa in the sitting room was past its best and instructions for the video would’ve helpful. There are quite a few steps up to the building but there is a lift once inside. We would definitely return to this apartment and can recommend it highly. Oh and you do need a car. The view is fantastic and being able to walk into the port brilliant! we loved the steps down to the sea and swimming here every day. There wasn’t much sun on the pool area as it was towards the end of September and the apartment didn’t get any sun at all. We loved sitting on the balcony and the view is fantastic. The apartment is well furnished and equipped. Beds were hard but comfy - the master bedroom was a bit damp feeling/smelling which is because it’s built into the rock. In high summer this may not be a problem. Overall we had a lovely stay here. There were a couple of cleaning issues. Relaxing apartment away from the town but close enough to enjoy the sights. The apartment was comfortable and very well equipped with everything we needed to make our stay extremely enjoyable. The whole process from booking to vacating was problem free thanks to the prompt and effective communication from both David (in the UK) and Dawn (in Majorca) who also provided useful local information. The port itself was very picturesque and had a well a stocked supermarket, also a bakery/coffee shop & restaurants. Enjoyable stay! Beautiful location stunning views. Dawn and Barrie couldn't have been more helpful. Very nice apartment and very well equipped. Beautiful location and lovely pool. Access to sea brilliant. Mallorca is widely regarded as one of the jewels of the Mediterranean. Easily accessible from the UK in just over 2 hours. Port D'Andratx in the South West of the island has grown from on old fishing village. There is still a fish market in the town every evening where the local catch is sold. These days it attracts a glamorous international crowd and has a number of famed restaurants and boutiques as well as some great, but sophisticated night life.